A fixed combination of an antimicrobial and retinoid is effective in the management of mild to moderate acne. Nadifloxacin, an antimicrobial and adapalene, a retinoid have frequently been used separately by dermatologists in the management of acne. Nadifloxacin, a topical fluoroquinolone, is reported to have potent action against P. acne, S. epidermidis and methicillin-resistant Staphylococcus aureus (MRSA), with no cross-resistance with any other antibiotic or with another fluoroquinolone. Previous studies have reported that topical application of nadifloxacin cream exhibited excellent efficacy and tolerability, and did not induce resistance in P. acnes strains. ,,, Adapalene, a topical retinoid is known to modulate keratinization and possesses anti-inflammatory action. Previous studies have reported adapalene to be safe and well tolerated as compared with other retinoids. ,, The present study evaluated the efficacy and safety of the topical premixed formulation of nadifloxacin 1% and adapalene 0.1% in the treatment of acne vulgaris. The study protocol was approved by respective Institutional Ethics Committees and Independent Ethics Committee (Ethics R U, Mumbai, for the sites other than institutional sites) and was conducted in accordance with the Declaration of Helsinki and good clinical practice guidelines. The clinical trial registry (CTRI) number of the study is CTRI/2013/05/003616. Male or female subjects (≥12 years) suffering from mild to moderate acne on the face, with mixed non-inflammatory comedones and inflammatory papulo-pustular lesions were enrolled in the present study. Subjects with known hypersensitivity to individual ingredients or any other closely related agent from quinolone or retinoid class, those suffering from severe acne requiring systemic drugs for management or any severe concomitant diseases, patients receiving any systemic antibiotics during two weeks prior to study, pregnant women and nursing mothers were excluded from the study. This was an 8 week (Sep 2010-May 2011), non-randomized, open-labeled, prospective study conducted at five centers (B J Medical college and Civil Hospital, Asarwa Ahmedabad, Mukhi Skin Clinic Nagpur, Rajiv Gandhi Medical College and Chhatrapati Shivaji Maharaj Hospital, Kalwa, Thane, M. S. Ramaiah Medical College, MSR Nagar, Bangalore, and Lokmanya Tilak Municipal General Hospital and Lokmanya Tilak Municipal Medical College Mumbai) across India. The study consisted of three follow up visits- end of week 2 (Day 14 ± 2), end of week 4 (Day 28 ± 2), and end of week 8 (Day 56 ± 2). All subjects were screened after obtaining a written informed consent for participation in the study. Eligible subjects were asked to apply 1% nadifloxacin and 0.1% adapalene gel (manufactured by Wockhardt Ltd, Aurangabad, Aug 2010, batch no: SSD (546)-03-09, expiry: July 2012) over the affected area of the face once daily in the night after washing face and before going to bed. The drugs were supplied by the investigator. The efficacy parameters were evaluated at each visit. At the end of week-8, the subjects were also investigated for laboratory parameters - complete blood count (CBC), liver profile [Serum Glutamic Oxaloacetic Transaminase (SGOT) and Serum Glutamic Pyruvate Transaminase (SGPT)], and renal profile [Blood Urea Nitrogen (BUN)] and serum creatinine. The efficacy of the 1% nadifloxacin and 0.1% adapalene gel was evaluated based on the reduction from baseline in the number of non-inflammatory lesions (comedones), reduction in the number of inflammatory lesions (papules, pustules, nodules), reduction in the total number of acne lesions, reduction in the severity of acne as per combined acne severity classification,  and improvement in global assessment scale of acne toward normal clear skin. For this study, 30 subjects were planned to be enrolled at each center to arrive at a sample size of 100 analyzable subjects. Descriptive statistics was used for demographic variables. For total, inflammatory and non-inflammatory lesion counts, Friedman test was used for a comparison from baseline. For the comparison of acne severity scores, global assessment score from baseline to end of week 8, gamma statistics was used. Gamma statistics measures the strength of association of the cross tabulated data (baseline and end of week-8 data in this case) with variables when both are measured at the ordinal level. The laboratory parameters were analyzed using Wilcoxon`s signed rank test. Data was analyzed using SPSS analytic software 9.2, (USA, Enterprise Guide version 4.2). Overall, 119 subjects were enrolled (Ahmedabad-30, Nagpur-30, Bangalore-30, Thane-18, and Mumbai-11) in the present study. Of these, two subjects were lost to follow-up and one was withdrawn from the study due to "flare-up of lesions" and was considered as a treatment failure. Thus, 116 (97.5%) subjects completed the study. 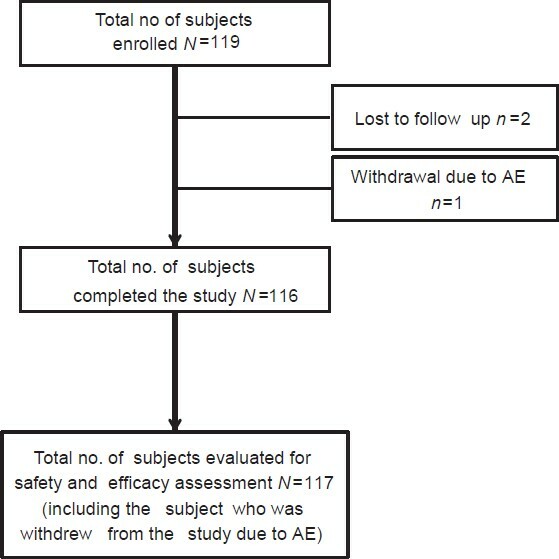 A total of 117 subjects (intention to treat population) were considered for efficacy analysis including the incomplete but evaluable subject who was withdrawn from the study [Figure 1]. The baseline demographic characteristics of the subjects are presented in [Table 1]. The age of the patients ranged from 13 to 41 years; a majority were females (60%) and most of the subjects had an oily skin (79%). A statistically significant progressive reduction in non-inflammatory lesion counts, inflammatory lesion counts, and total lesion counts were seen at the end of week 2, end of week 4 and end of week 8. Reduction and percentage change in acne count from baseline is presented in [Table 2]. Overall, of the 117 subjects, 115 subjects (98.3%) showed improvement. Treatment failure was noted in two subjects (1.7%) as the 1% nadifloxacin and 0.1% adapalene gel did not work effectively. A progressive reduction in acne severity was also observed. Of the total four subjects with severe acne at baseline, three had severe acne at week 4 (25% reduction) and only one had severe acne at week 8 (75% reduction; P < 0.001) [Table 2]. 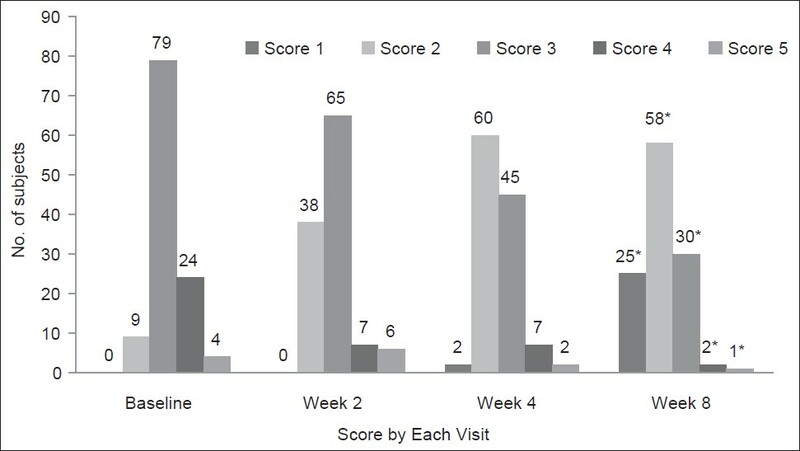 A progressive reduction in physician's global assessment scores of acne severity was noted (P < 0.001 for within group comparison at week 8 with respect to baseline, [Figure 2]). The laboratory parameters at the baseline and at the end of week 8 did not show any clinically significant difference. All AEs reported in the study were mild to moderate in severity. Overall, 24 AEs were reported from three centers (15 subjects). No serious adverse events (SAEs) whether expected or unexpected were reported from any participating centers [Table 3]. The most frequent AE was application site dryness. The results of the present study demonstrate a significant reduction in both the inflammatory and non-inflammatory acne lesions over an 8-week period of treatment with a fixed dose combination of 1% nadifloxacin and 0.1% adapalene gel. This reduction in the total acne lesions over the entire treatment period correlates well with the simultaneous decrease in the severity of acne. Thus, by the end of 8 weeks, 74% of the patients were in the mild severity acne group with 71.5% of the patients having their score approaching to that of normal healthy skin by the end of week 8. Similarly, progressive reduction in acne severity (69.2%) and physician's global assessment score for acne severity (75.0%) at the end of week 8 was also noted. Nadifloxacin is a synthetic bactericidal fluoroquinolone with a broad spectrum antibacterial activity against aerobic Gram-positive and Gram-negative and anaerobic bacteria, including P. acnes and S. epidermidis.,, In recent years, antibiotic-resistant propionibacteria have been isolated with increasing frequency and carriage of resistant strains has been associated with antibiotic treatment failure. A systematic review identified 12 studies that investigated the presence of resistant P. acnes in the skin of people who had received topical or systemic antibiotics. Nadifloxacin, by virtue of its proven potent action and tolerability and relative newness, is a newer alternative to clindamycin for the management of acne. A 10-year surveillance study (n = 4274) in the UK found that resistance of P. acnes to erythromycin and clindamycin increased from 34.5% in 1991 to 55.5% in 2000 (peaking at 64% in 1997). Such high risk of antibiotic resistance necessitates the search for newer potent antibiotics that can be judiciously combined with retinoids to ensure better efficacy. Several published studies have established the efficacy and safety of nadifloxacin in the management of acne. ,,, A comparative analysis of the efficacy and safety of the combination of antibiotic and retinoid (adapalene) with adapalene monotherapy in patients with moderate to severe acne showed that the combination therapy led to a significantly greater reduction in the number of acne lesions after 8 weeks than adapalene monotherapy. The combination therapy improved inflammatory acne earlier than adapalene along with a 40% reduction in the lesions by week 2 with the combination compared to about 19% reduction with adapalene alone. Similarly, the results of the present study show 98.2% reduction in the lesions by the end of week 8. In the global assessment score for acne severity, an aggravation in acne severity was observed at week 2 among the patients with score 5. This could be due to the unmasking of underlying micro-comedones caused by adapalene in the combination. Initial flare up of acne is a common observation with retinoids. In the present study, only 15 subjects reported 25 AEs, which were mild to moderate in severity. Thus, the results of the current study have demonstrated that once daily use of fixed dose combination of 1% nadifloxacin and 0.1% adapalene gel is a safe and well-tolerated topical treatment for mild to moderate acne. In conclusion, the combination of nadifloxacin (1%) and adapalene (0.1%) has been found to be effective in the treatment of mild to moderate acne with good tolerability. However, the lack of a control group and non-comparative design of study limits the utility of these results. We cannot also deny any bias in the study due to its open labeled design. These findings should be considered as preliminary findings and further research is needed in the form of well-designed, adequately powered trials with a control group to understand the efficacy of fixed combination of nadifloxacin (1%) and adapalene (0.1%) treatment in Indian subjects. "All authors participated in analysis and interpretation of data and critical revision of the manuscript. The authors acknowledge Knowledge Isotopes (professional medical writing company, www.knowledgeisotopes.com) for writing this manuscript and subsequently revising the draft by incorporating author comments." 1. Strauss JS, Krowchuk DP, Leyden JJ, Lucky AW, Shalita AR, Siegfried EC, et al. Guidelines of care for acne vulgaris management. J Am Acad Dermatol 2007;56:651-63. 2. Kubba R, Bajaj AK, Thappa DM, Sharma R, Vedamurthy M, Dhar S, et al. Acne in India: Guidelines for management-IAA consensus document. Indian J Dermatol Venereol Leprol 2009;75 Suppl 1:1-62. 3. Thiboutot D, Gollnick H, Bettoli V, Dréno B, Kang S, Leyden JJ, et al. New insights into the management of acne: An update from the Global Alliance to Improve Outcomes in Acne group. J Am Acad Dermatol 2009;60:S1-50. 4. Nenoff P, Haustein UF, Hittel N. Activity of nadifloxacin (OPC-7251) and seven other antimicrobial agents against aerobic and anaerobic Gram-positive bacteria isolated from bacterial skin infections. Chemotherapy 2004;50:196-201. 5. Group. O-AS. Clinical assesstment of 1% nadifloxacin cream against superficial bacterial skin infection. Nishinihon J Dermatol 1996;58:296-304. 6. Asada Y. Clinical assessment of 1% OPC-7251 cream, a new topical antibacterial agent in acne vulgaris. Nishinihon J Dermatol 1990;52:790-4. 7. Jung JY, Kwon HH, Yeom KB, Yoon MY, Suh DH. Clinical and histological evaluation of 1% nadifloxacin cream in the treatment of acne vulgaris in Korean patients. Int J Dermatol 2011;50:350-7. 8. Brogden RN, Goa KE. Adapalene. A review of its pharmacological properties and clinical potential in the management of mild to moderate acne. Drugs 1997;53:511-9. 9. Caron D, Sorba V, Clucas A, Verschoore M. Skin tolerance of adapalene 0.1% gel in combination with other topical antiacne treatments. J Am Acad Dermatol 1997;36:S113-5. 10. Cunliffe WJ, Danby FW, Dunlap F, Gold MH, Gratton D, Greenspan A. Randomised, controlled trial of the efficacy and safety of adapalene gel 0.1% and tretinoin cream 0.05% in patients with acne vulgaris. Eur J Dermatol 2002;12:350-4. 11. Cunliffe WJ, Poncet M, Loesche C, Verschoore M. A comparison of the efficacy and tolerability of adapalene 0.1% gel versus tretinoin 0.025% gel in patients with acne vulgaris: A meta-analysis of five randomized trials. Br J Dermatol 1998;139 Suppl 52:48-56. 12. Liao DC. Management of acne. J Fam Pract 2003;52:43-51. 13. Leyden JJ. A review of the use of combination therapies for the treatment of acne vulgaris. J Am Acad Dermatol 2003;49:S200-10. 14. Wolf JE Jr, Kaplan D, Kraus SJ, Loven KH, Rist T, Swinyer LJ, et al. Efficacy and tolerability of combined topical treatment of acne vulgaris with adapalene and clindamycin: A multicenter, randomized, investigator-blinded study. J Am Acad Dermatol 2003;49:S211-7. 15. Dreno B, Bettoli V, Ochsendorf F, Layton A, Mobacken H, Degreef H. European recommendations on the use of oral antibiotics for acne. Eur J Dermatol 2004;14:391-9. 16. Gollnick HP, Krautheim A. Topical treatment in acne: Current status and future aspects. Dermatol 2003;206:29-36. 17. Thiboutot DM, Shalita AR, Yamauchi PS, Dawson C, Arsonnaud S, Kang S, et al. Combination therapy with adapalene gel 0.1% and doxycycline for severe acne vulgaris: A multicenter, investigator-blind, randomized, controlled study. Skinmed 2005;4:138-46. 18. Tunca M, Akar A, Ozmen I, Erbil H. Topical nadifloxacin 1% cream vs. topical erythromycin 4% gel in the treatment of mild to moderate acne. Int J Dermatol 2010;49:1440-4. 19. Plewig G, Holland KT, Nenoff P. Clinical and bacteriological evaluation of nadifloxacin 1% cream in patients with acne vulgaris: A double-blind, phase III comparison study versus erythromycin 2% cream. Eur J Dermatol 2006;16:48-55. 20. Kurokawa I, Akamatsu H, Nishijima S, Asada Y, Kawabata S. Clinical and bacteriologic evaluation of OPC-7251 in patients with acne: A double-blind group comparison study versus cream base. J Am Acad Dermatol 1991;25:674-81. 21. Baker M, Tuley M, Busdiecker FL, Herndon JH Jr, Slayton RM. Adapalene gel 0.1% is effective and well tolerated in acne patients in a dermatology practice setting. Cutis 2001;68:41-7. 22. Williamson P, Kligman AM. A new method for the quantitative investigation of cutaneous bacteria. J Invest Dermatol 1965;45:498-503. 23. Cooper AJ. Systematic review of Propionibacterium acnes resistance to systemic antibiotics. Med J Aust 1998;169:259-61. 24. Coates P, Vyakrnam S, Eady EA, Jones CE, Cove JH, Cunliffe WJ. Prevalence of antibiotic-resistant propionibacteria on the skin of acne patients: 10-year surveillance data and snapshot distribution study. Br J Dermatol 2002;146:840-8. 25. Vogt K, Hahn H, Hermann J, Haustein UF, Blume U, Gollnick H, et al. Antimicrobial evaluation of nadifloxacin (OPC-7251), a new topical quinolone, in acne vulgaris. Drugs 1995;49 Suppl 2:266-8. 26. Kobayashi M, Nakagawa T, Fukamachi K, Nakamura M, Tokura Y. Efficacy of combined topical treatment of acne vulgaris with adapalene and nadifloxacin: A randomized study. J Dermatol 2011;38:1163-6. Though these two products are being used separately in the management of acne, this is the first time that this fixed combination is formulated and evaluated in Indian patients The fixed combination of adapalene (0.1%) and nadifloxacin (1%) could be a safe and effective treatment for mild to moderate acne vulgaris.